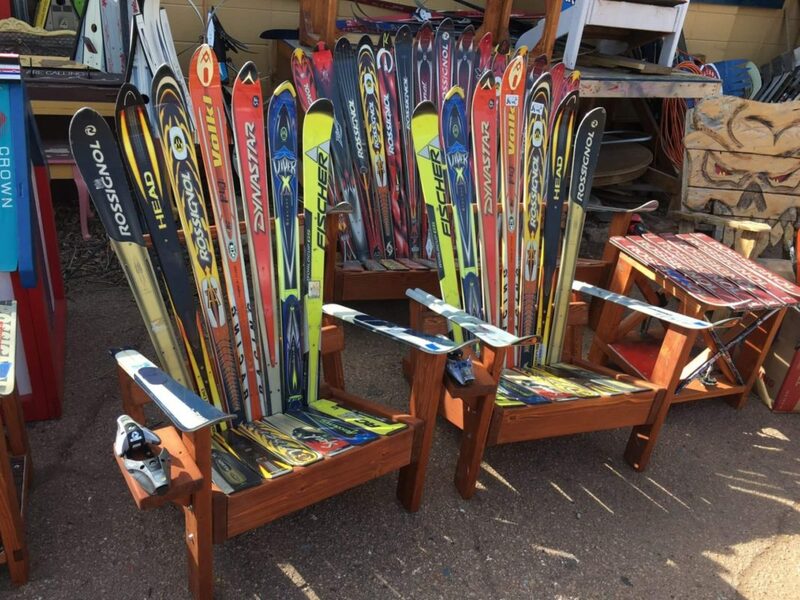 Add comfort, longevity & style to your seating area!! 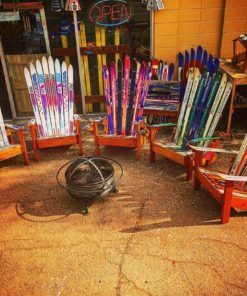 Perfect for a fire pit area, patio, deck or yard anywhere!! 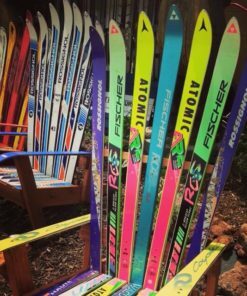 You can request the colors and/or brand of skis in the order notes during checkout. Made of Redwood and Douglas fir, these chairs are all hand made here in Colorado and will last for years! Very sturdy and high quality. They measure 50″ tall by 36″ deep and 32″ wide with the binding cup holders. 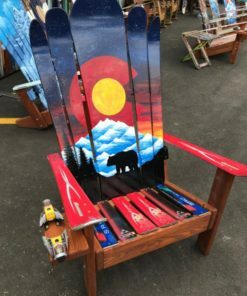 We can paint most anything for you and ship it to you for $79/chair shipping. 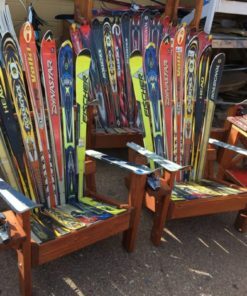 Order 4 chairs at a time and save! 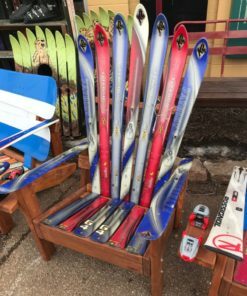 Set of Four Ski Chairs – Special pricing! 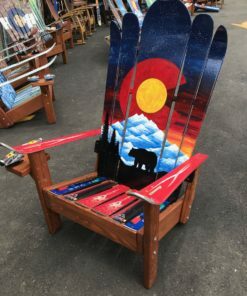 We can also do side tables and rockers and benches and other pieces that you will love and will accent or complete your porch setup in a way that will look beautiful and unique. 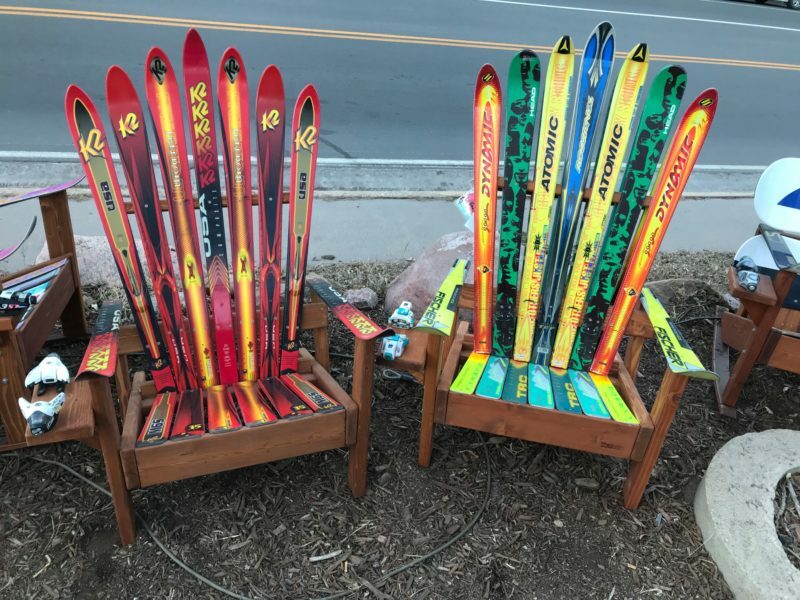 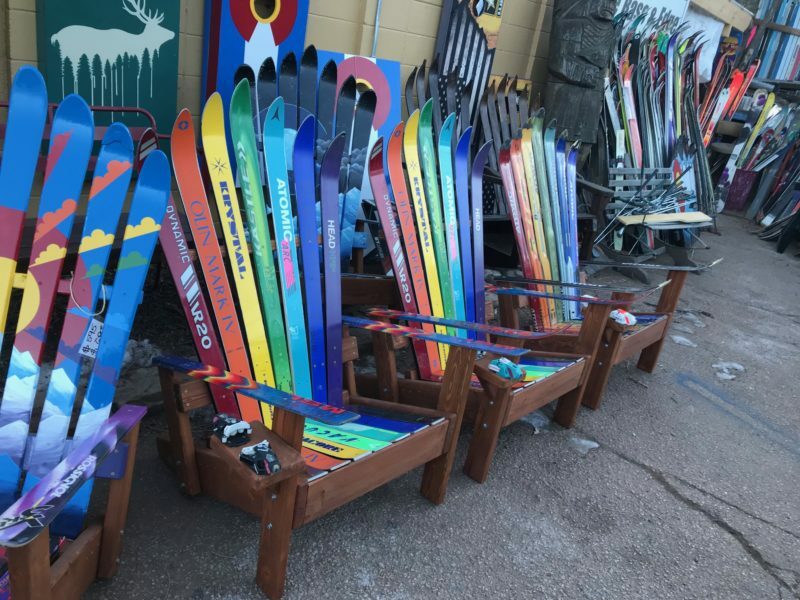 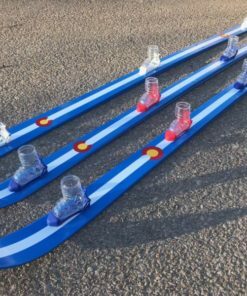 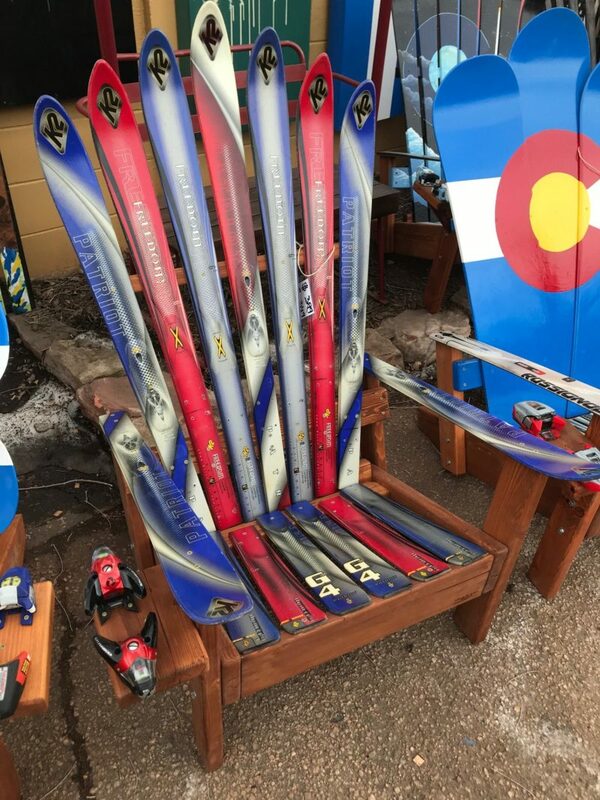 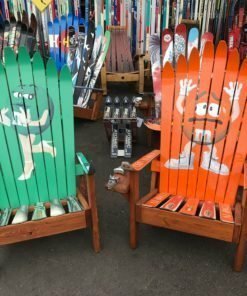 We can add paint to the skis or to the front board of the chair as well to give you a unique, custom look with your name, or favorite state or sports team or flag, whatever you think would look great, we can create it for you! 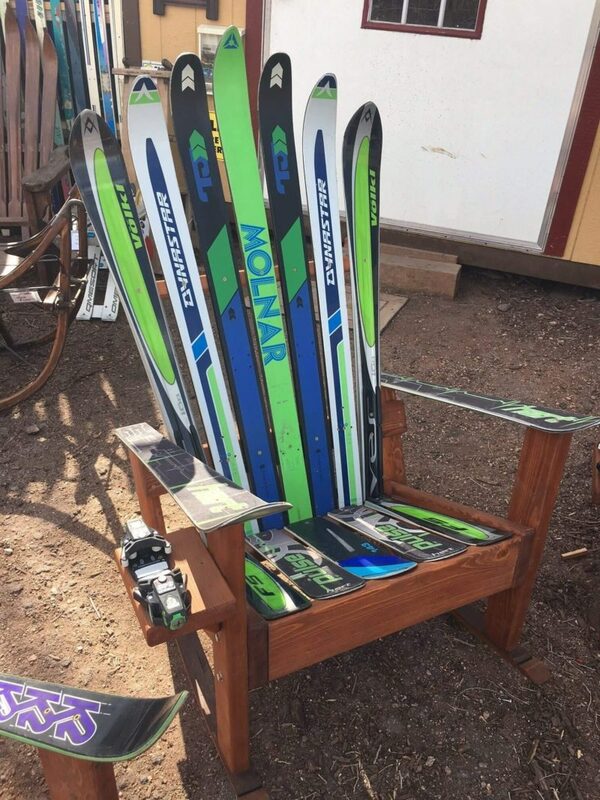 If you’re looking for the perfect gift for someone, we’ve got you covered! 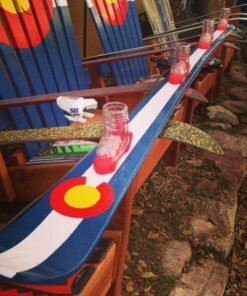 Colorado gifts galore! 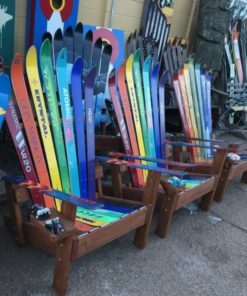 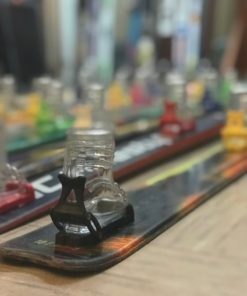 All sorts of fun and unique creations here, and if you don’t see what you want, just let us know and we’ll make it for you! 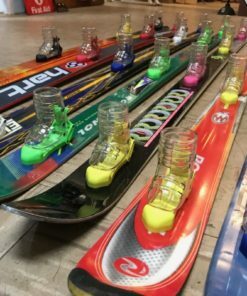 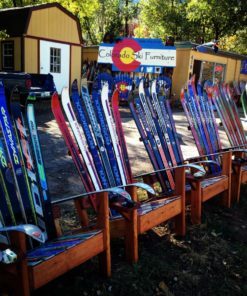 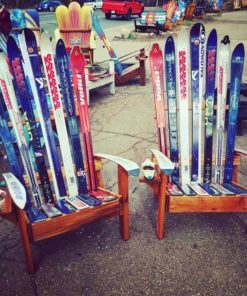 Our passion for winter sports has lead us around the world in search of not only mountains and powder but also vintage and antique skis, snowshoes, vintage snowboards, antique sleighs and sleds. Inquire if you’re in search of any particular item or style and we can either find it or make it for you! 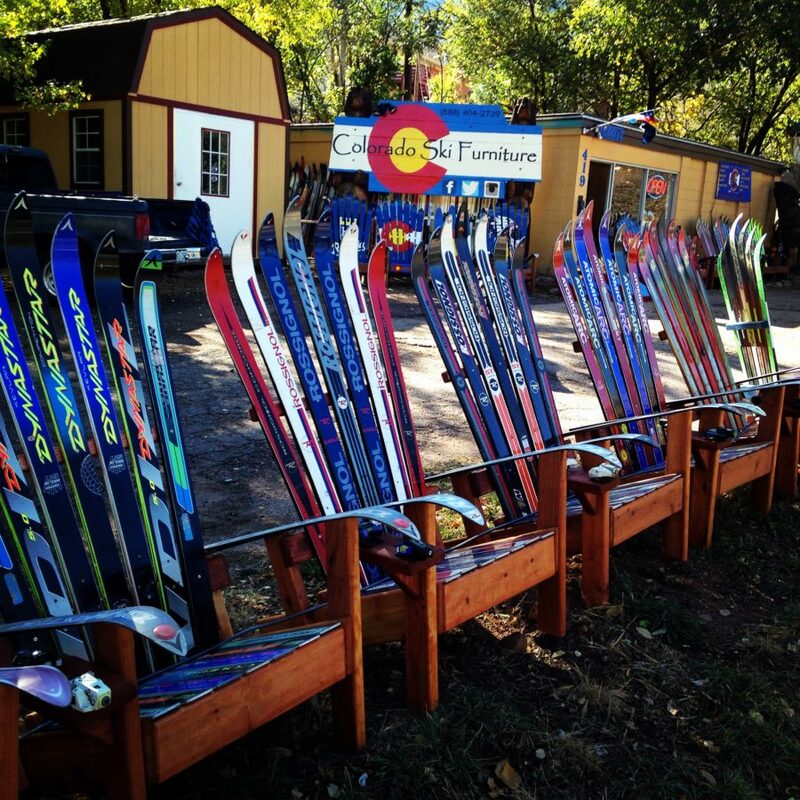 Our inventory is constantly changing as well. 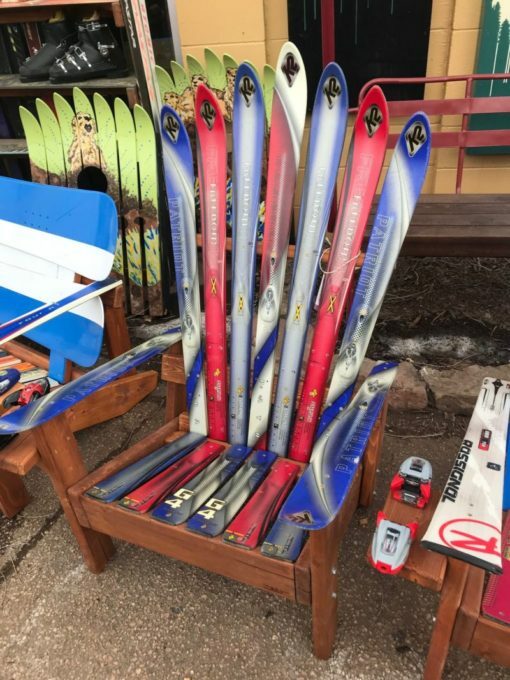 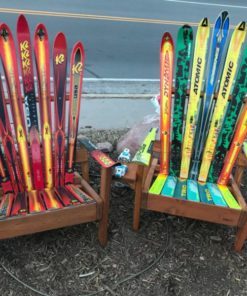 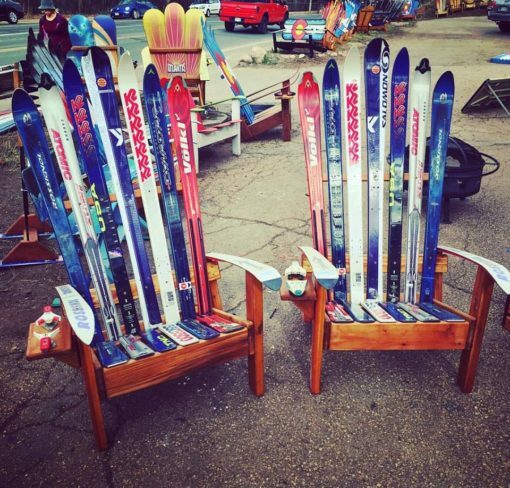 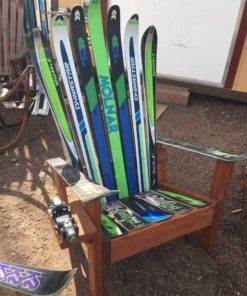 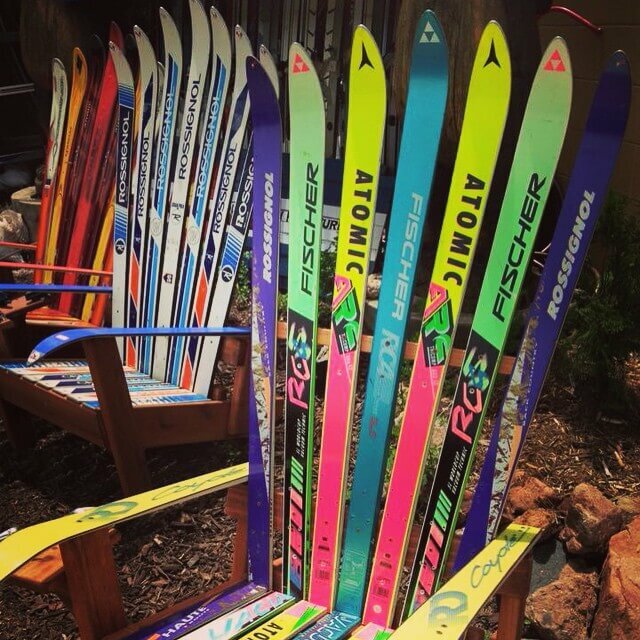 A custom painted ski chair for your deck, patio or yard is always super popular! 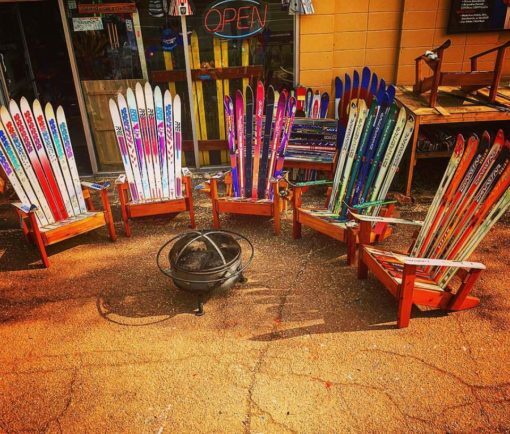 Give us a quick call or email with your ideas and we’ll help you out! 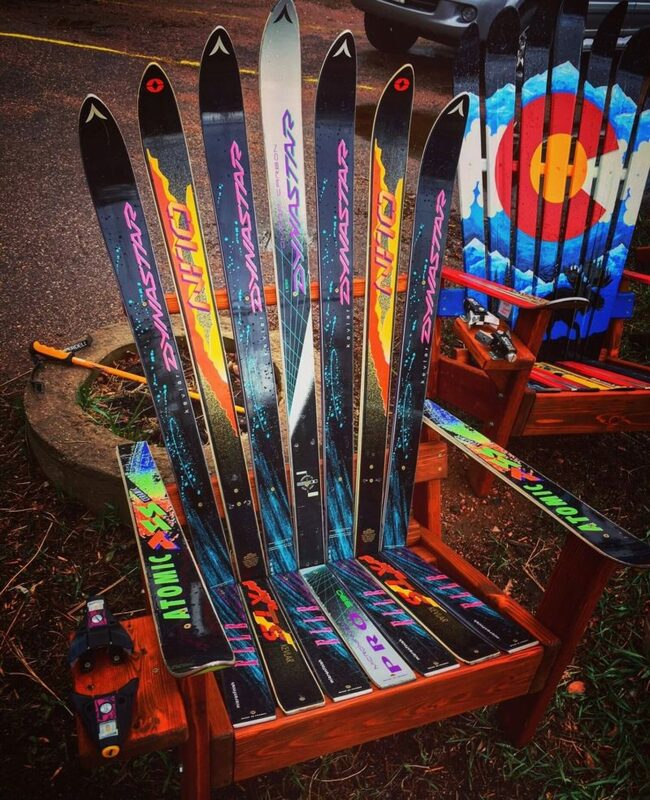 Email: coloradoskichairs@gmail.com or CALL #888-404-2739. 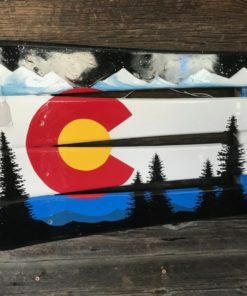 Delivery service to all of Colorado including: aspen, denver, boulder, fort collins, loveland, colorado springs, castle rock, highlands rach, vail, breckenridge, telluride, winter park, steamboat, snowmass, basalt, glenwood springs, avon, beaver creek, frisco, silverthorne, salida, buena vista, crested butte, telluride and more! 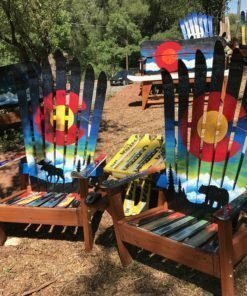 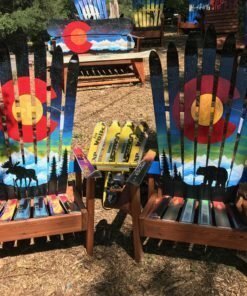 Order a custom painted ski chair delivered right to your door! 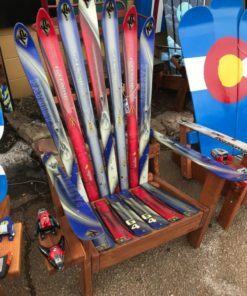 Call us today for a custom quote on a piece for you or a loved one! 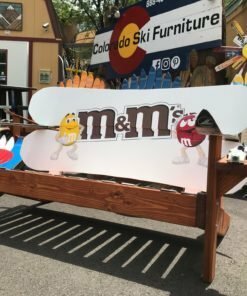 We also do logos and corporate and small business custom pieces as well. 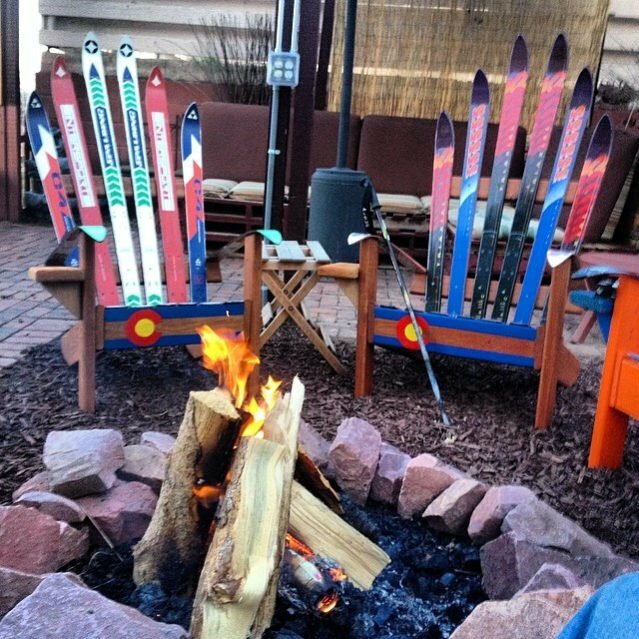 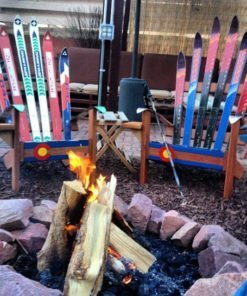 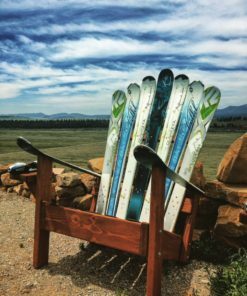 Order Two or Four Ski Chairs – Special pricing!